We appreciate that moving to a new school is a huge adjustment for parents and students, if you have any queries on any of the information in this section or any questions about your child joining The Brakenhale School, please do not hesitate to contact us. We very much look forward to meeting all new starters and working together with you and your child throughout their education. 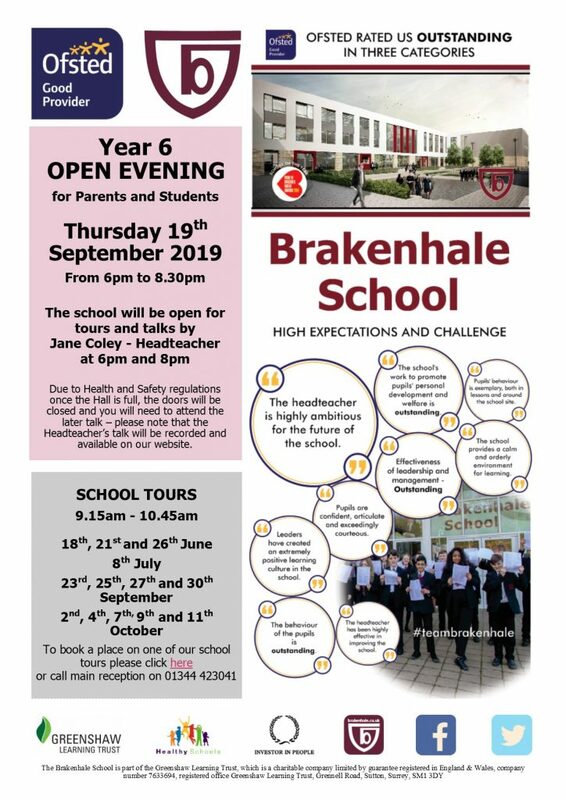 For starting Year 7 at Brakenhale in September 2020 School Tours are now available for booking. Please see below for our admissions procedures and criteria. We sent information to parents and students week commencing 4th March 2019. Student Registration Forms to be completed and returned to the school by Wednesday 20th March 2019. Please telephone the school on 01344 423041 if you would like further information. We will be sending information to parents and students week commencing 5th March 2018. We will also send the Student Registration Form to be completed and returned to the school by Wednesday 21st March 2018. Both days really supported the Year 6s in becoming part of #teambrakenhale. Lessons were engaging, activities enjoyable and challenging and the atmosphere clear, positive but with consistent expectations. A massive thank you to all the staff, Year 10 student ambassadors and all students for their support and interactions. Parents/carers have a statutory right of appeal under the School Standards & Framework Act 1998 if a place is not offered. Appeals for entry in September 2018 must be received by Friday 28th April 2018 at the latest if these are to be heard by the Independent Appeals Committee by Friday 7th July 2018. Appeals received after Friday 28th April where possible, will be heard by Friday 7th July 2018; however, this will depend on the date the appeal is lodged and cannot be guaranteed. Our Open Evening for Year 6 students starting in Year 7 in September 2018 was held on Thursday 21st September 2017 and parents had the opportunity to meet the Headteacher and other senior leaders and have a tour of the school. We held a Year 6 Information Evening for parents in September which gave parents the opportunity to meet the Headteacher and other senior leaders and to attend introductory sessions on key curriculum and pastoral issues. Below you can find information given out during the evening. This was followed by our Year 6 Open Evening for parents and students with tours of the school and a talk by the Headteacher and tours of the school during the working day during September and October. We have sent information to parents and students about the school, together with admissions forms to be completed and returned. Form should be returned by Friday 17th March 2017. Please telephone the school on 01344 423041 if you would like any further information. Appeals for entry in September 2017 must be received by Friday 28th April 2017 at the latest if these are to be heard by the Independent Appeals Committee by Friday 7th July 2017. Appeals received after Friday 28th April where possible, will be heard by Friday 7th July 2017; however, this will depend on the date the appeal is lodged and cannot be guaranteed. Our aim is to encourage and develop excellence in our students in all aspects of their school life, from their experiences in lessons to the wide range of extra curricular activities on offer. In recognising our students as individuals we offer a ‘personalised learning approach’ that involves setting high expectations and individualised subject targets for each student. Progress towards these targets is tracked throughout the year and achievement recognised and rewarded. During the Summer term Year 6 students are invited to two induction days, during which they will take part in various activities and sample lessons to allow them to get to know us and we them. For students starting in the September the induction dates will be confirmed during the year. During the visit students will meet their tutor group and be involved in a varied programme including sampling lessons and team building activities. This year the students will also complete CAT tests. There is no preparation that the student can do, and please reassure your child that these are nothing to worry about. There will be a meeting during the summer term for parents/carers and students to meet the Senior Leadership team, Head of Year and tutors. We will also be hosting a coffee morning where you will have a further opportunity to meet the Headteacher, Head of Year and other and other key adults who will be supporting your child during their education. In accordance with the School Admissions Code 2014, The Greenshaw Learning Trust is currently consulting on the admission arrangements for The Brakenhale School for entry in September 2020/21. Please click here to view the proposed admission arrangements.